The Department of the Prime Minister and Cabinet provides advice to other Australian Government agencies on many aspects of public administration. 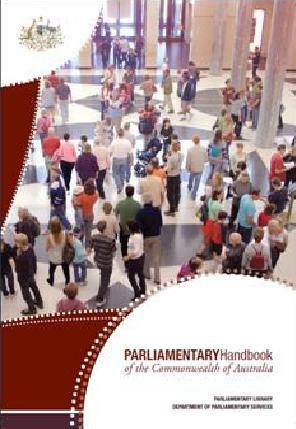 The Parliamentary Handbook is a comprehensive reference work on aspects of the Commonwealth Parliament and the Australian political system. It contains political biographies of all Members of both Houses since the initiation of Federation together with details of parliamentary committees and elections along with additional useful information. The Executive Council Handbook is produced as a reference for ministers, parliamentary secretaries, and their officials as an aid in the preparation of papers for consideration by the Governor-General in Council. The purpose of this handbook is to provide a description of the procedures involved in making Commonwealth Acts, especially the procedures coordinated by the Department of the Prime Minister and Cabinet (PM&C). Commonwealth financial management handbook by Department of Finance. Facts on government : a guide to the Federal Government by Michael Harrington. The following books provide useful information about Australian government publications. A guide to Commonwealth government information sources / by John Cook, Nancy Lane, Michael Piggott. The guide to government publications in Australia by Michael Harrington. ARGAP : a research guide to Australian politics and cognate subjects by Henry Mayer with Margaret Bettison and Judy Keene. ARGAP 2 : a second research guide to Australian politics and cognate subjects by Henry Mayer and Liz Kirby.